When wired onto faux stems, succulent rosettes—despite having no roots, soil or water—make long-lasting floral bouquets. 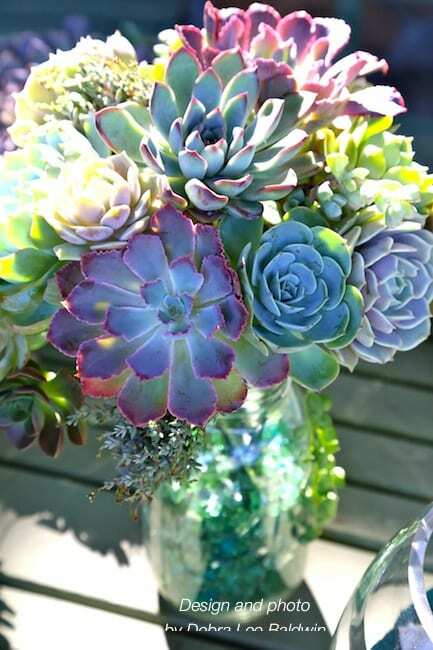 Echeverias, graptosedums, crassulas and kalanchoes lend themselves beautifully to bouquets because of their colorful leaves and floral shapes. They’re easy to attach to stems, need no water (because they live off moisture in their leaves), look good for a long time, and can later be planted as cuttings. At one of my workshops, a student made this lovely bouquet of wired succulent rosettes, ‘Sticks on Fire’ stems, and red eucalyptus. For ballast, she added layers of sunrise-colored sand. This is a bouquet I made before I learned the floral technique of wiring succulent rosettes. The reason for the arrangement was to show how the plants resemble flowers. It consists of aeoniums and graptoverias with long stems. 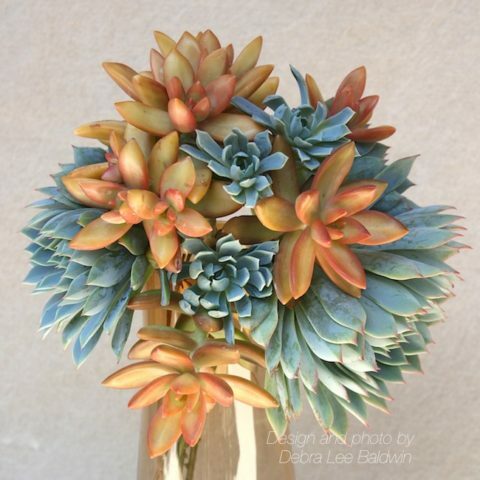 But in general, succulents have short stems, or stems so thick they don’t work well for vase arrangements. I made these bouquets for the launch party for my book, Succulents Simplified, which has similar plants on the cover. I used marbles as ballast and filled the vases with water to keep the flowers fresh. The stems are bamboo skewers. After the aloe flowers faded in the bouquet shown earlier, I pulled them out and arranged the succulent rosettes in a different vase (with no water). They looked good for several more weeks. I made this bouquet of echeverias, dwarf aloes and silver eucalyptus stems for a garden club at which I was speaking, for a raffle. It took me forever to wire so many rosettes (30 @ 3 min./ea. = 1-1/2 hours). The response was gratifying, but I’m not eager to do it again! The amber color of the glass vase inspired the selection of ‘Coppertone’ stonecrop, which in turn inspired blue echeverias for contrast. Wired rosettes are heavy, so you need something to anchor them. Here I used crushed, tumbled glass. (I made this a few years ago. I wonder, should I have filled the jar with glass? At the time, I thought it was cool to let the wired stems show.) Succulents include jade, aeoniums, sedums, and in the center for texture contrast, a fuzzy kalanchoe. When stems are this short, you needn’t stabilize them with floral picks or bamboo skewers. Above: The colors of the succulents inspired the colors of sand. (I keep a palette of colored sand in jars that occupy an entire bookshelf.) Read more about how this arrangement came together. I agreed to demonstrate how to make a succulent bouquet at the Northwest Flower & Garden Show. Few colorful succulents were available, so I wired red and silver tillandsias onto stems as filler and included dried floral material. I had brought a bag of split peas for ballast, so imagine my delight when my volunteer brought seeded eucalyptus—an unplanned yet delightful repetition. It’s nice to place the bouquet in a container that’s also a gift, such as a pretty coffee mug. This one is filled with playground sand as ballast. A jay looks interested in my spring ’18 succulents-and-sand bouquet. Another bouquet of wired succulent rosettes anchored in colored sand, made by one of my students. — Handle succulent leaves minimally because they mar easily. Hold cuttings by their stems or the underside of the leaves. — Unless you’re using heavy rosettes, floral picks or skewers aren’t necessary with short-stemmed arrangements (wires wrapped with tape are adequate). — As with any good design, select elements that are colorful, textural, and provide pleasing repetitions and contrasts. — It’s nice to place the bouquet in a container that’s also a gift, such as a pretty coffee mug. My book, Succulents Simplified, pp. 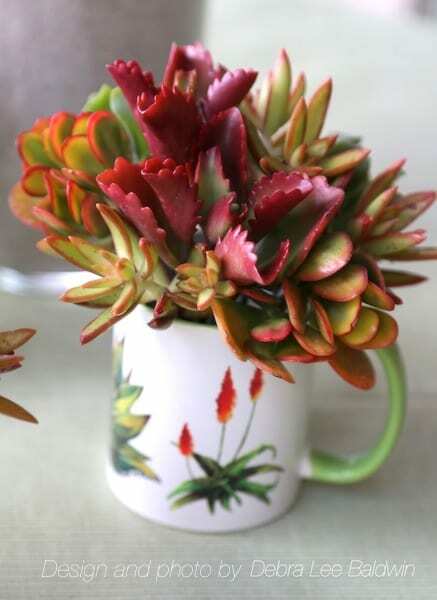 162-169, shows how to make a special occasion succulent bouquet. 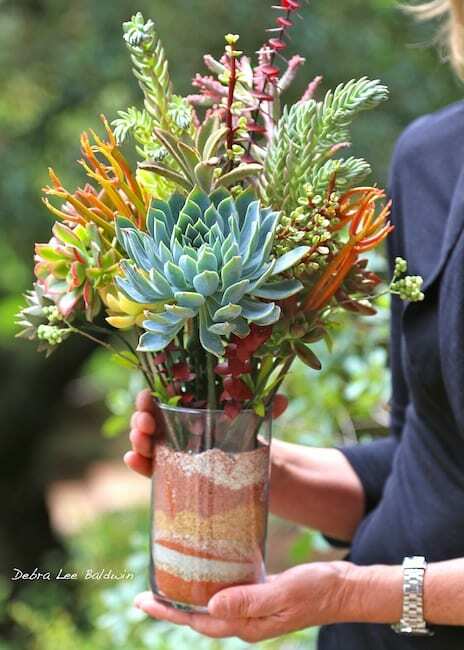 My Craftsy Class: Stunning Succulent Arrangements ~ See how I made this bouquet in a Mason jar with crushed glass for ballast. Use this link to take my Craftsy class (all seven lessons) at 50% of the regular enrollment price—$20 instead of $40. Enjoyed this article? Please share it! Can you give me an idea of how long one of these will last? How long can I expect to enjoy the echeveria stem, let’s say, before needing to take it apart to give it a chance to root? And other than keeping the arrangement out of direct sun. would you have any care recommendations? © 2019 Debra Lee Baldwin. All Rights Reserved.